I cannot believe that my little June is two years old. Last Sunday we celebrated her 2nd birthday with friends, family and a potato head themed birthday party. 😂 June adores her potato head, which she affectionally calls "Yatwo". Since her party was potato head themed, I decided to stick with potatoes for the food as well. For our gathering with friends in the morning, I made these sweet potato pancakes! And for dinner with our families we had a loaded baked potato bar, and cupcakes with the eyes, lips, and noses from potato heads as toppers. I told you guys I would figure out how to make the sweet potato pancakes I had in Nashville, and with the deadline of June's party set, I figured it out. 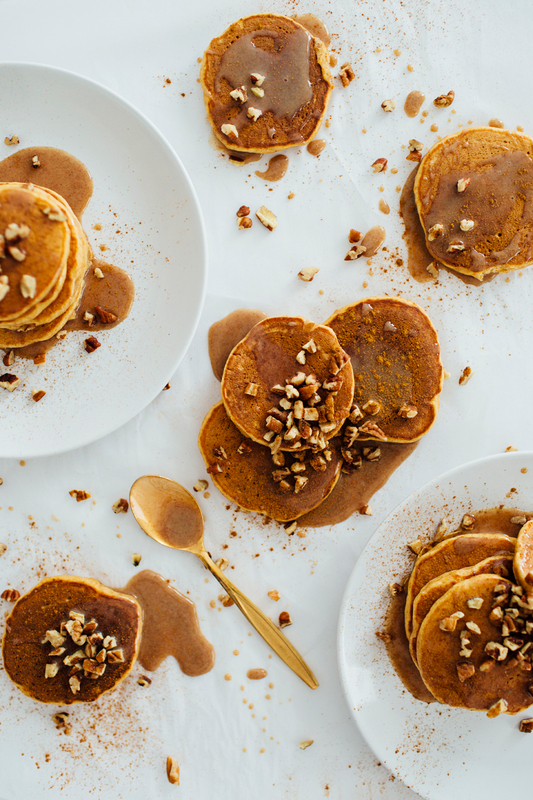 If you've actually had sweet potato pancakes from Pancake Pantry before, I will tell you right know that these are not nearly as sweet or sugary. As completely delicious as those were, it was literally like eating cake and icing. I cut way back on the sugar, so I wouldn't feel bad eating an entire stack of them for breakfast. 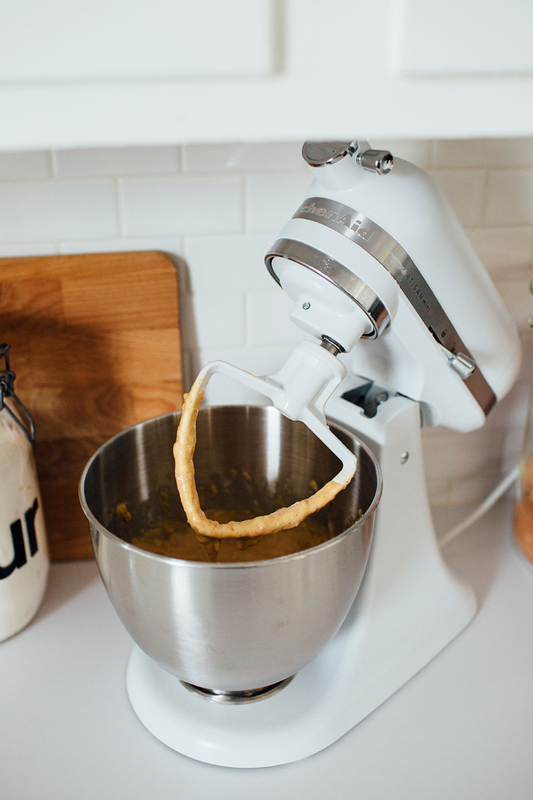 I also used my KitchenAid® Artisan® Mini Mixer to speed up the process. (Let's be real though, I use it whenever I can because it's so cute.) 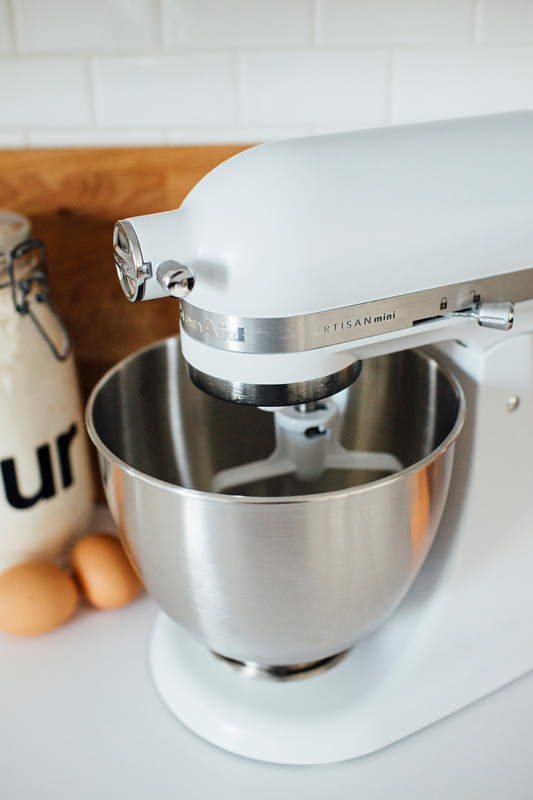 It's literally just a lighter and smaller version of the iconic Kitchen Aid stand mixer. I love that it stores easily in my small cupboards, and how it's small enough to sit on my counter and not hit my upper cabinets when I lift up the paddle/top part to add more ingredients. Again, did I mention how cute it is?! First, cook your sweet potato however you prefer. On the day of June's party, I was already baking other potatoes in the oven, so I did it that way. However, when I tested this recipe earlier in the week, I peeled my potato, diced it into cubes and steamed it until soft. (Poke with a fork to make sure it's soft enough to mash in your mixer.) One time I even peeled, diced and microwaved it. So really, any method works! 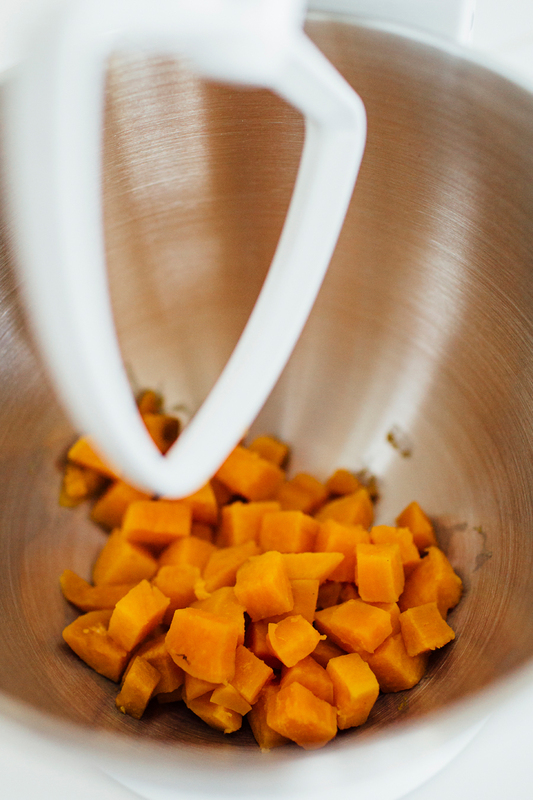 Once your sweet potato is soft and fully cooked, dump it into your mixing bowl and mix until smooth. 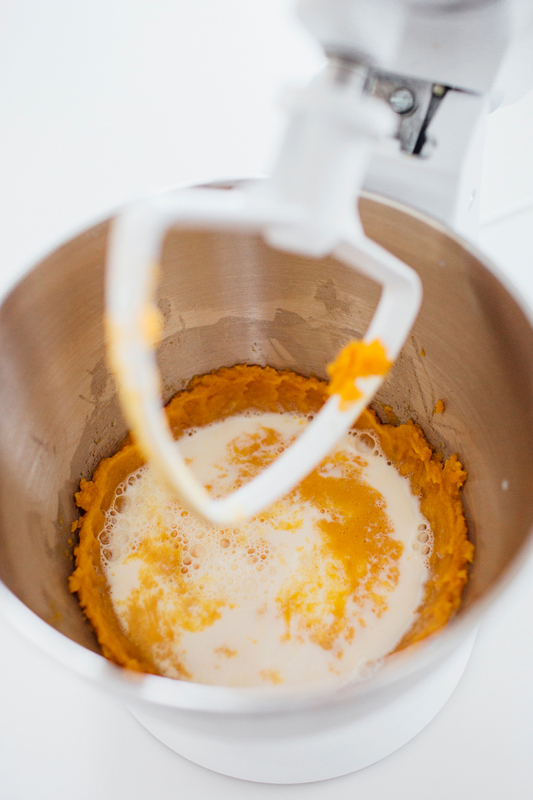 Scrape down the edges of your mixer, and then add the milk, egg, vanilla and brown sugar. Mix on medium high until well combined. It should look like a very runny sweet potato soup at this point. In a separate bowl, combine the flour, baking soda, cinnamon, nutmeg, cloves and salt. Mix well. Add flour mixture to wet ingredients and mix until combined. Don't over do it! Just go until its totally incorporated and then stop. Heat your griddle or pan to a medium heat. If using a non-stick cooking surface, there is no need to spray it with oil. Using your tablespoon from earlier, scoop pancake batter onto griddle. I know it seems like way too small of a scoop, but just try it! It creates the perfect little pancake size - just right for stacking 3-5 on your plate. 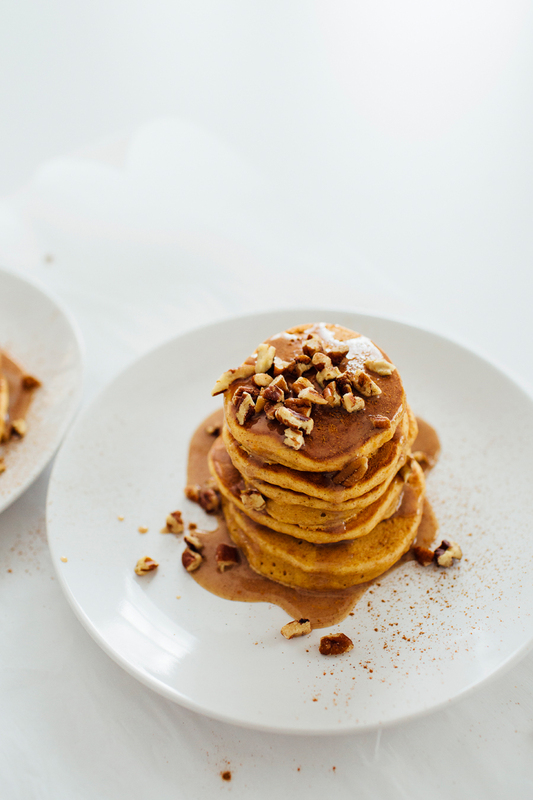 While still keeping an eye on your pancakes, combine your sweetened condensed milk, syrup, and cinnamon in a microwave save bowl. Heat it in the microwave briefly before you serve it on your pancakes! This post was sponsored by KitchenAid. As always, all opinions and recipes are my own.